As a child growing up in Switzerland, I used to watch a studio potter work on the wheel on my walk home from school. 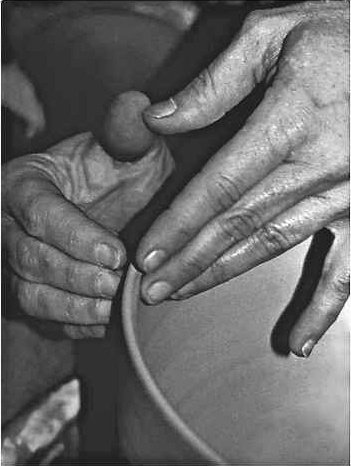 Those daily visits seeded the inspiration that eventually grew into a lifelong passion for working with clay. However, my journey as an artist was originally detoured by my Swiss father’s practicality leading to completing my studies in business-accounting. Subsequently I was employed by Arthur Andersen accounting firm as an auditor in Milan and Paris. After four years I realized that although it was a promising career my heart was not in it. I felt the need to return to my original passion, so I went back to art school to study ceramics at the former Eidgenössische Keramische Fachschule in Bern. Being of European origin I was initially influenced by the work of Gertrude and Otto Natzler, Hans Coper, and contemporary Scandinavian pottery, but also inspired by the Celadon, Oxblood, Shino and Chun glazes of Asian origins, may of these forming the base for my personal glaze formulations. Through this love for traditional pottery, I’m striving for an organic, not contrived but rather quiet quality by continually searching for a delicate balance between form, surface texture and movement resulting in personal, contemporary objects. I find the entire journey a dynamic fusion of artistic inspiration, mastery of glaze chemistry and above all the intriguing mystery that flames add to the process, creating a metamorphosis by fire, always leaving room for serendipitous surprises. These are the joys, tensions and explorations I engage in while creating my pieces but in the end, I feel the work should simply speak for itself.